Hello, there! In this guide we are going to look at how to install the Linguistics for Adobe Brackets plugin, an offline as-you-type spell checking plugin. This guide was written for the lastest version of Brackets (at the time of writing) - Brackets 1.11. The first step to installing this plugin is to make sure that you have Brackets installed. You can do this by visiting http://brackets.io/ and downloading the installer for your platform of choice. There are two sets of files that are needed to enable the spell checking features within Brackets. These are the core spell checking libraries themselves and the dictionary files. 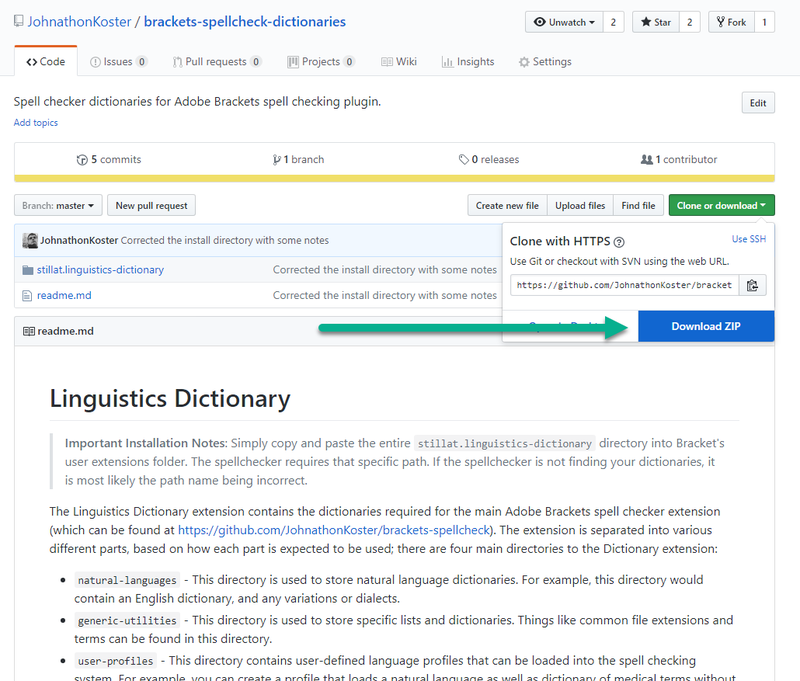 The core plugin can be downloaded from https://github.com/JohnathonKoster/brackets-spellcheck and the dictionaries can be downloaded from https://github.com/JohnathonKoster/brackets-spellcheck-dictionaries. These are the folders that we will copy into our user extensions folder within Brackets. Installing the plugin in Brackets is incredibly simple. Start Brackets and activate the Help menu item and then select Show Extensions Folder. This will open a new Finder or Explorer window (depending on your platform) displaying your Bracket's extensions folder. By default, you should have both a disabled and a user folder. We need to copy both the stillat.linguistics and stillat.linguistics-dictionaries folders into the user folder. It is important that you only copy the stillat.linguistics and stillat.linguistics-dictionaries folders; the naming of the dictionary folder is important for everything to work as intended. After you have done this, simply restart Brackets and the spell checking plugin should be activated. 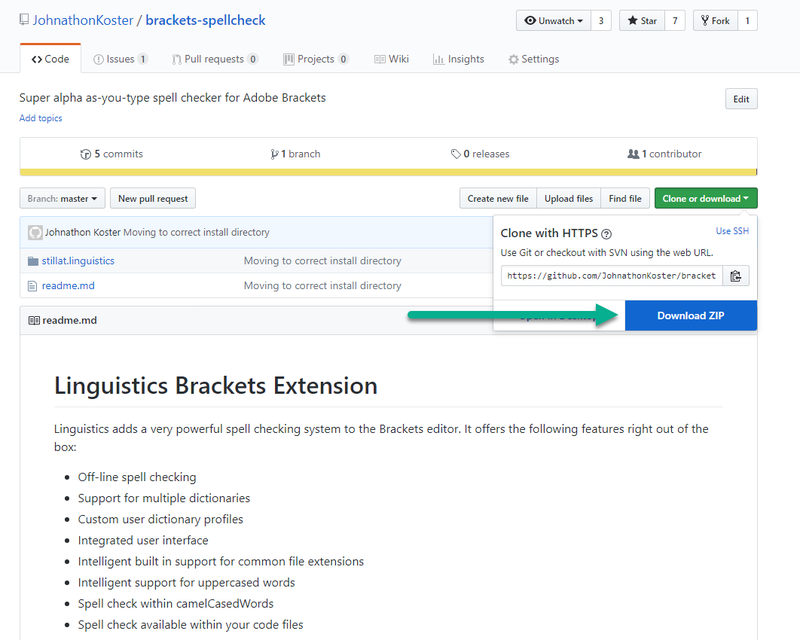 Installing the Linguistics for Adobe Brackets plugin is a fairly simple process; within a matter of minutes you can level up your Brackets install with awesome spell checking capabilities. If you've enjoyed this guide make sure to share it with your friends and colleagues, leave a comment or send a message; it's all welcomed! I installed the above and now "Proofing Options" appears in status bar, and there is an option to "Enable/Disable the spell checker" which is clickable, and "Set as default language" which is not clickable. There is nothing that indicates whether or not it is enabled. I started typing, deliberately misspelling words, and nothing happens to show misspelled words, I clicked the "Enable/Disable the spell checker", same result when typing misspelled words. I looked under the menu items to find something like "start spell check", but nothing exists. Why is this not working. I have Brackets version 1.11 installed. This is the second time I sent the above, wanted to make sure I put in the right email address.